Handheld Photo Cutter for bottle opener keyring BO1. This is a new product, expecting new stock by end of Aug 2011! Handheld Photo Cutter for heart shape keyring K05. Handheld Photo Cutter for round keyring K06. 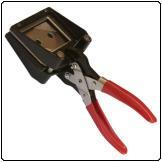 Handheld Photo Cutter for oval keyring K08. Handheld Photo Cutter for House shaped key rings K09.